At $349, the LG Watch Urbane is anything but a cheap Android Wear smartwatch. That said, it now looks like LG might be preparing an even more expensive version of its latest wearable. 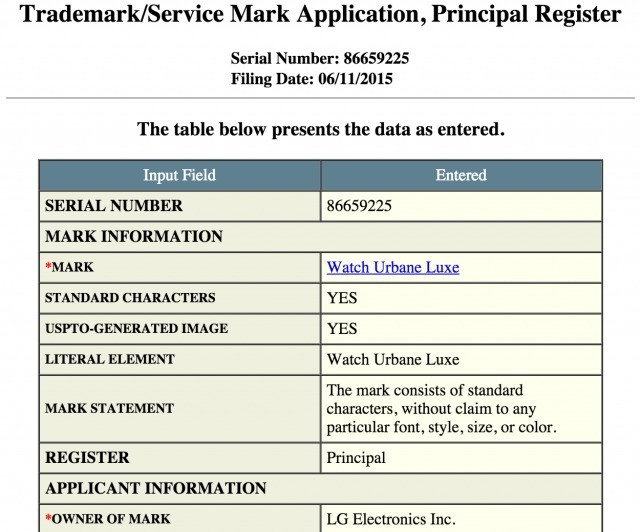 What you see in the screenshot above is a trademark filing by LG Electronics for “LG Watch Urbane Luxe”. This has been revealed today, and it obviously makes us think that a higher-end iteration of the watch is in the works over in South Korea. Whether it will be marginally more expensive than the Watch Urbane that’s already shipping, or if it will emulate the Apple Watch Edition and go into ‘thousands of dollars’ territory remains to be seen. Anyway, with the G Watch R being phased out, LG was almost left with just one smartwatch on the market. That, however, may change soon thanks to the Watch Urbane Luxe.